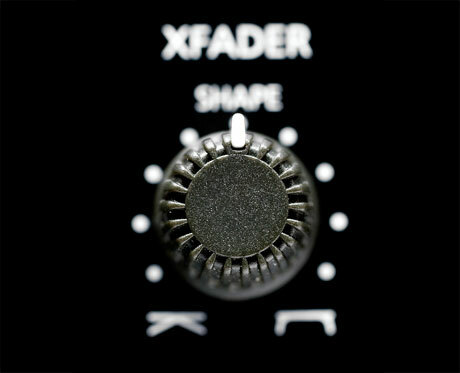 Remember when I unleashed the skratchdriver in Ecler's size zero mixer the NUO2.0 and discovered that even dropping an Eternal or Innofader into the slot didn't improve curve performance to a degree that made tablists happy? Well it seems that Ecler digested, cogitated and acted upon these words and have announced a program that will make the NUO2.0 (plus 3.0 and 4.0)a solid purchase for even the scratchiest of DJs. I've done this before, but I really think that all you controller haters with your heads firmly stuck up your arses need to watch this. DeezNotes wowed me once before with his demo on the new Serato ITCH based Vestax VCI-300 wundercontroller, but this much better demo goes even further and shows that regular beat juggling and cutting is easily achievable, without the need for full sized decks, vinyl or back breaking crates. See... it's very possible to rock a crowd and rock it well with a controller. 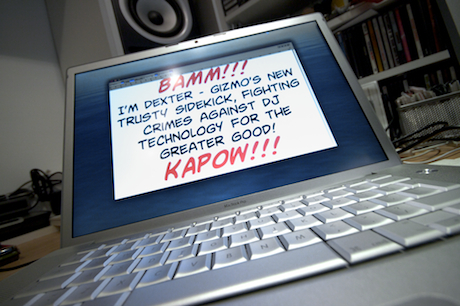 The skratchmac is dead - long live the skratchmac! Ladies and gentlemen - please take a moment of silence to pay your respects to a dearly departed member of the skratchworx team. When I made the leap from full time employment into a life of stress, long hours but heaps of fun, the chosen travelling companion on this rollercoaster ride was Rufus (we men like to name inanimate objects) aka my trusty G4 Powerbook. Sadly, Rufus was killed in an unfortunate power surge accident last week, and while we mourn the loss, life must go on. So please say hello and give a warm welcome to Dexter - the new trusty sidekick aka a shiny pretty multi-talented MacBook Pro. 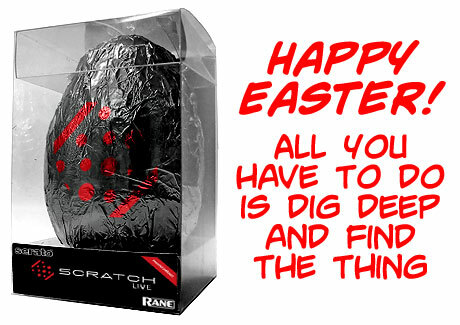 Skratchworx HQ has hit a majorly serious problem. A power cut and subsequent power surge when it restarted has left the elderly but previously solid and stable skratchmac dead. I get a power light on the adaptor and the battery charges, but outside of that it's an ex-mac - it has ceased to be. 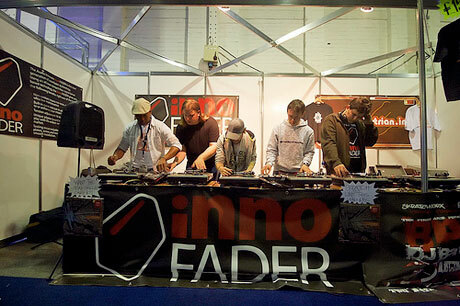 The best stand at BPM? Apparently it was Audio Innovate. But why? It didn't have the glitz and showbiz of Pioneer, or the amazing technological display of Stanton. But it did have DJs - lots of them all having a great time. And it's fair to say that I did have a small hand in it. Allow me to explain. So here's the scene - I'm seriously stressing, running around like a headless chicken and generally panicking while setting up the stand at BPM. A stream of friends pops by to see how things are going, including Jason - head honcho at HTFR - offering Stanton Diablo carts and slipmats for the show. A very nice offer indeed so of course I accepted, as it would be impolite not to, but was putting brand new needles onto a stand the very best idea I ever had? It seems that the answer was yes. HDJ-2000 - sooo good but $450 good? 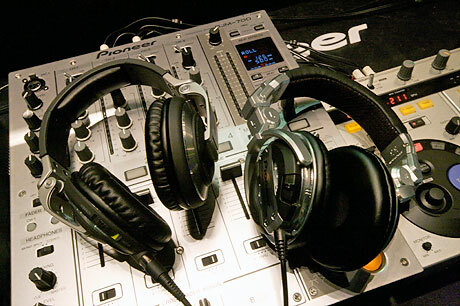 So let's talk about these new Pioneer HDJ-2000 cans for a moment. Having unleashed them last week as the only fresh product release at the BPM Show, all eyes and ears were on the striking yet �ber expensive offering. I had a go and came away with mixed feelings. Those cheeky chappies at Serato do like to mess with the minds of their customers sometimes, but usually in a very nice way. This time it's another Easter Egg. I know what it is but do you? It was only released this weekend at the BPM Show and was demoed to me by the one and only Big Wiz. I would put it in the not easy to find category, but loop rolling is in effect in the current release of Scratch Live. But can you find it? So let's get this out of the way right away - I'm an bleeding idiot. Having spent all week making absolutely sure that I'd got everything ready for BPM and the battle, I went and forgot my USB cable for my camera. Fear not, for despite the greatness of the first day of BPM, there's not a lot of new hotness to take pictures of. I do have shots of the new Pioneer cans but that's about it. But you'll have to wait until at least Sunday night. 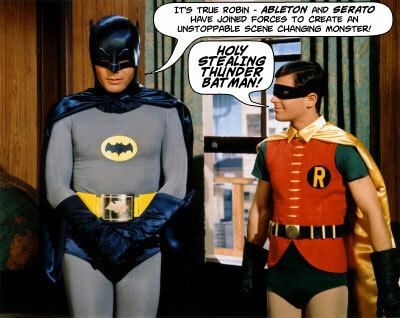 Just as the DJ world created embarrassing damp patches with the aforementioned Traktor evolution, two behemoths of the DJ scene have confirmed speculation that something was afoot. As sure as death and taxes, Serato have announced that they're hanging out with Ableton - just one day after day that NI made their own huge announcement. 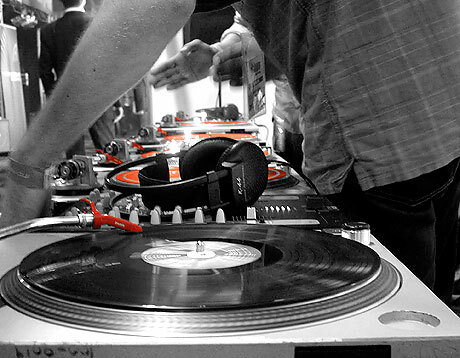 Everybody sing along... "Ableton and Serato sitting in a tree..."
Having given up the easy life with steady income and worked my arse off for 5 years just for you guys, I've worked myself into the esteemed position of respected DJ hack, which in turn got me and a few chosen fellow hacks invited to the Native Instruments mothership for an exclusive glimpse at the "Future of Traktor". I wasn't especially sure of what to expect but when I saw the future unfold before my eyes (as well as a signature on an NDA), I liked what I saw. NI have listened to user feedback and combining this with their own directions and ideas, they've moved Traktor to the next generation. 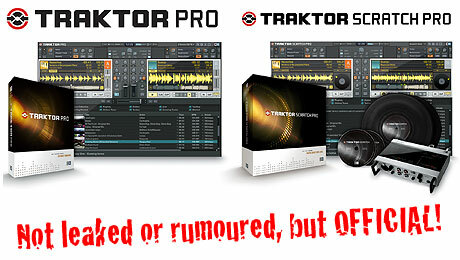 No longer a number but Pro - welcome to the brave new world of Traktor Pro and Traktor Scratch Pro. Show time means new goodies. I know BPM is only small right now compared to the epic sprawling likes of MusikMesse and NAMM, but last year Pioneer released the stunning CDJ-400 and the monstrous slab of pant wetting nextlevelness SVM-1000 AV mixer thingy. So when I heard that Pioneer had a new release ready for BPM, my heart started pumping just a little more as Word opened up the PR... be still my beating heart... oh... it's a set of cans. 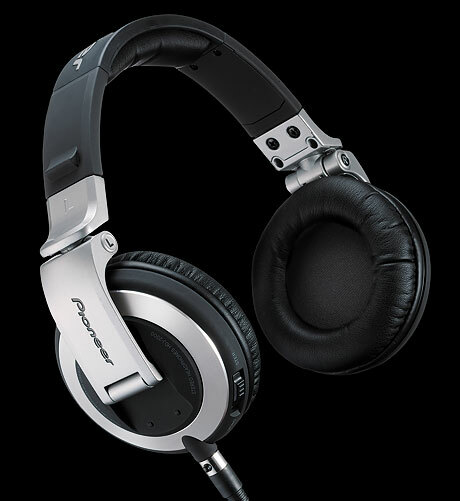 Behold - the new Pioneer HDJ-2000 headphones. 5 days till BPM - grabs tickets now! So you know when I said you only had a couple of days to pre-order tickets for BPM? I wasn't lying as such - just imparting the info I had given to me. But it seems that the whole ticket buying mechanism has been upgraded or something to allow you to collect your tickets on the day. So you still buy tickets through the banner above, this link, or the banner in the right hand column, but you'll just need to ask the ticket people nicely for them on the day. And remember, every ticket bought through skratchworx helps us grow just that little bit more. In one week, the second BPM show will be underway, and if you want to save �4 on the ticket price, the deadline for advance sales is Monday at 10am. The busy BPM beavers have to drop them into envelopes and put them in the post so that you can get them in time. Remember - every ticket bought through skratchworx helps us grow. Click the above banner or this link to make sure you get your tickets before the Monday deadline. 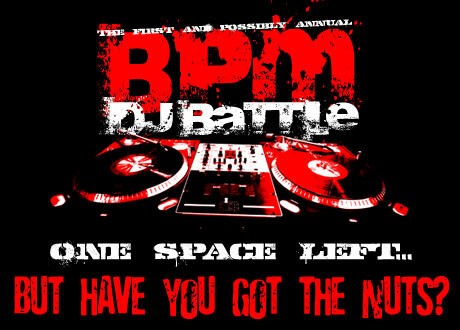 Just about everything is in place for the previously posted BPM battle. Sponsors - check. Enormous bloody pile of booty - check. Stand with 3 sets of decks - check. Competitors - Jon1st, Rasp, Johnny1Move, Sinical, Sole1, Etch-A-Sqratch, Loop Skywalker, Furious P, Weetamix... wait a minute... there's one missing. Bugger. So it seems that there's a space for the Saturday battle. Do you think you've got what it takes to step up? I'm not just giving these prizes away you know. Promo distribution used to be a matter of driving round record shops with a vanful of white label vinyl. Replace the white van with the interweb and vinyl with files and you've got Serato's Whitelabel - the now out of seemingly perpetual beta distribution channel that gives Scratch Live users a veritable shedload of free promo material. Yep - it's now official. 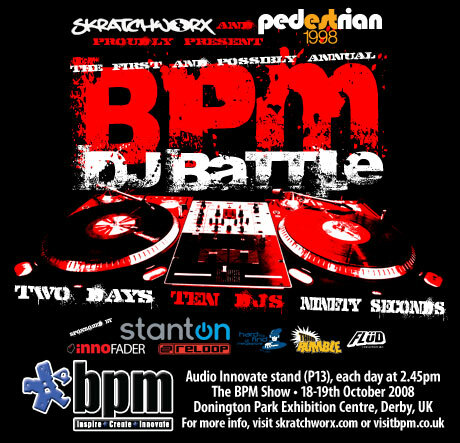 The BPM show is just around the corner. And what can you expect to see there? Oh I'm sure some manufacturer or other will have some sort of new hotness on display. But who cares about such tawdry things when I've organised a battle stretching across both days! And there's one place left on the Saturday event so read on if you fancy entering. But be warned - the entrants so far are all DMC level. You can get your tickets by clicking on the BPM banner in the right hand column or click this link. 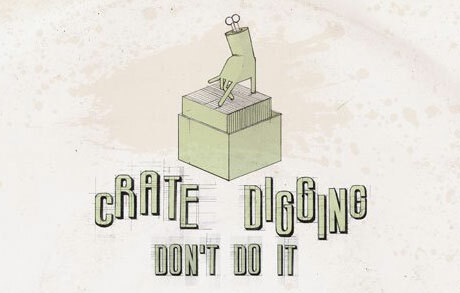 Part of the fun of being a DJ (well vinyl ones anyway) is crate digging - the act of fruitlessly sifting through racks of crap in your local record store for the new hotness, or better still hunting down real gems in charity shops and car boot sales for not much cash. But it's not without it's darker side, which has been rather disturbingly illustrated in a set of images from Dutch artist and obvious digger Stefan Glerum.